NONE of the animals in this book are octopi. Nope, don’t think so. DEFINITELY not. Nuh-uh. Or are they? Now we know what octopi do all day! This totally unique board book is part seek-and-find, part counting lesson, part animal book, and 100% FUN. 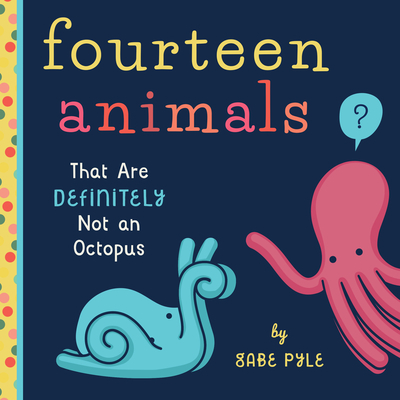 In this hilarious book of animals, artist Gabe Pyle presents fourteen beloved animals who are definitely not an octopus--or are they? Observant youngsters will love uncovering each octopus cleverly disguised in 14 animals' shapes. Based on the immensely popular Threadless t-shirt, 14 Animals (That Are Definitely Not an Octopus) is a fresh, witty romp through the animal kingdom that even adults will find hard to resist.